14 March 2018: Billingham has added the Hadley Small Pro to its renowned Hadley camera bag range, offering exceptional protection for small mirrorless system cameras, rangefinders and mid-sized DSLRs. Precision-engineered at Billingham’s manufacturing facility in the West Midlands, the Hadley Small Pro builds upon the successful Hadley Small – one of the company’s most popular bags – with the addition of several practical new features designed for professional photographers. Rugged, weather-resistant yet extremely compact and light, the Hadley Small Pro is perfect for travelling, or for carrying smaller equipment on location shoots or daily photographic work. The new bag will be available in six classic colour combinations from the end of March 2018 from authorised Billingham stockists and www.billingham.co.uk, and will have a suggested retail price of £200 including VAT. As with all Billingham products, the Hadley Small Pro is made in England, and crafted from the company’s highly durable canvas or colour-fast FibreNyte material. These hard-wearing textiles are bonded to Stormblock material: two layers of fabric fused with butyl rubber for ultimate weather resistance. Due to its special composition, Stormblock never requires ‘reproofing’, remaining water-resistant for its entire life. Following feedback from Billingham customers, the bag has been enhanced with a number of new features. A strong, padded, leather-reinforced handle has been added to the top cover to provide extra comfort and a secure grip. The adjustable, shuttle woven polyester shoulder strap is now detachable, transforming the Hadley Small Pro into a stylish, compact messenger bag when removed, ideal for photographers wishing to use it as carry-on luggage. A handy rear pocket, featuring a water-repellent zip for protection against adverse conditions, allows owners to stow important documents such as passports or tickets for quick and easy access when on the move. A durable rear luggage strap enables the bag to be conveniently retained on a trolley suitcase handle for fuss-free transportation. The Hadley Small Pro’s premium quality fittings and buckles have been manufactured from solid brass, while the trims and straps are made from the finest full-grain leather. Each bag has been carefully finished and numbered by an individual Billingham team member and carries a unique serial code, and the signature Billingham logo has been embossed into leather on the front main flap. Its sculpted top cover protects the contents from the elements, while inside the bag, a generously padded full-sized insert delivers excellent impact protection for valuable equipment, which can be unclipped and removed if required, to convert the Hadley Small Pro to a work bag, compact travel holdall or day bag for personal belongings. For additional flexibility, within the insert are two removable, repositionable padded vertical dividers that run the height of the bag, plus two smaller dividers for stacking lenses. The top of the insert features a padded flap, further safeguarding possessions from rain, and delivering added protection in the event of a fall or knock. Two spacious, expanding front pockets provide extra capacity for storing lenses or accessories, and incorporate studs that can be unfastened or closed for increased versatility. The leather front straps with Quick Release System ensure fast and discreet access to the equipment inside the bag, and can be effortlessly opened or secured with one hand. Two high quality brass buckles allow the photographer to adjust the leather straps to fit snugly around the front pockets and their contents. The Billingham Hadley Small Pro comes with a five year manufacturer’s guarantee. A family business, Billingham thoroughly sources and tests all materials, ensuring that every bag is built for maximum strength and reliability, using the most innovative, durable and authentic components. Manufacturing is carried out to meticulous standards of technical precision, and once the product passes the company’s rigorous quality checks, an individual laser-engraved woven label containing a unique 10-digit barcoded serial number is applied. This represents the Billingham seal of excellence, and allows the bag to be registered, identified and tracked throughout its life. More information on the Billingham range can be found at www.billingham.co.uk. The Billingham Hadley Small Pro will be available from www.billingham.co.uk and authorised Billingham stockists from the end of March 2018. Price includes VAT. Cradley Heath, UK – 28 June 2017: Billingham has announced the introduction of a new model to its acclaimed Hadley range, providing photographers with the highest quality protection for valuable camera equipment, laptops and personal possessions. Building on the success of the Hadley Pro, the Hadley One has been designed and precision-engineered in England by the Billingham team, incorporating a host of new features following feedback from photographers around the world. Manufactured from rugged, weather-proof FibreNyte canvas, complemented by strong top-grain leather, this premium bag is slightly larger than the Hadley Pro and offers spacious storage to accommodate a mid-sized DSLR body and lens combination, or a core CSC kit, along with a small laptop or tablet. 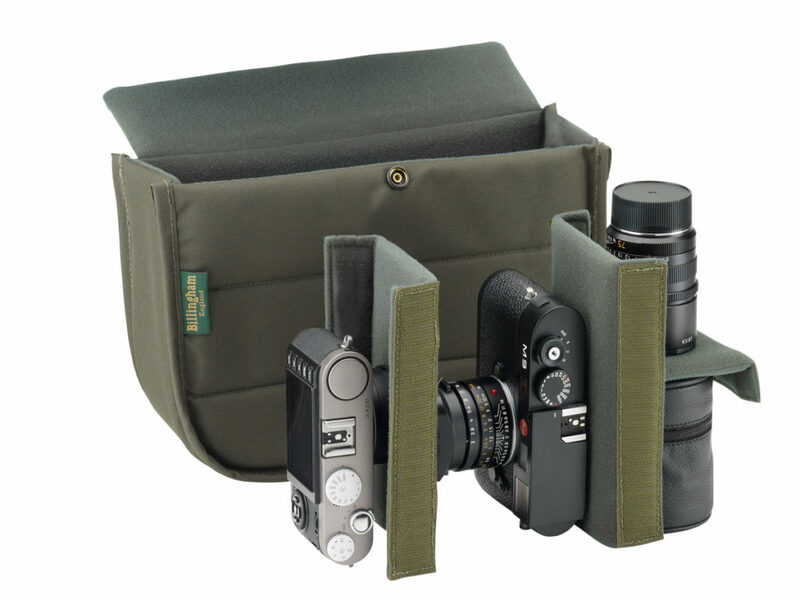 Completely adaptable to each photographer’s needs, its removable, full-height padded insert can be positioned within the bag to divide the interior and provide optimum space for all items, and a second optional insert can be added, for extra versatility. A fully padded laptop sleeve has been stitched into the back of the main compartment, to hold a tablet, 13” MacBook Pro or similar device securely in place. A robust top handle has been incorporated into the design, allowing the Hadley One to be carried as a briefcase or holdall, a features a re-engineered leather covering to provide extra comfort and a secure grip. The adjustable shoulder sling is manufactured from Billingham’s shuttle woven spun polyester and solid brass fittings, and can be completely removed if required. Billingham’s weather-resistant FibreNyte canvas delivers exceptional durability, colour fastness and protection from external elements. Extremely tough, yet light in weight, it never requires reproofing, retaining its water and heat-resistant properties throughout the life of the bag. Delivering maximum protection for heavier lenses and the all-metal bodies often featured in current CSC and DSLR products, the rear, side and bottom faces of the bag have been strengthened with foam padding. This also adds structure and support, making sure the Hadley One retains its shape whether completely full or just carrying a small number of items – and safeguards any equipment carried in the outside pockets. For additional customisation and storage capacity, external pockets can be fitted to the Hadley One, fastened to the thick leather layer to provide a secure mount for valuable accessories. The shoulder sling attachment has been riveted through the leather to form a core structure of the bag. In response to numerous requests from Billingham owners, a durable luggage trolley strap, enabling the user to retain the bag over the handle of a trolley suitcase, has been integrated into the Hadley One. This practical feature allows the photographer to access the rear zipped pocket when mounted, while a weather-proof zip closure keeps all contents dry in inclement conditions. The Hadley One is available in three FibreNyte and leather colour combinations: Sage & Chocolate, Khaki & Chocolate and All-Black. Billingham’s meticulous sourcing procedures ensure that all textiles and materials meet stringent criteria, guaranteeing that every bag is built from tested, innovative and durable components. As with all Billingham bags, the Hadley One is subject to extensive inspections and quality checks before being made available to purchase. Once complete, the bag receives its own laser-engraved label and individual serial number, allowing the owner to register the product, and enabling it to be identified and tracked throughout its lifecycle. The Hadley One comes with a five year guarantee. An extensive range of matching accessories is available for all Billingham bags, including top-grain leather shoulder pads for added comfort when travelling and leather luggage tallies in various colour options. Additional information on the Billingham Hadley One can be found at www.billingham.co.uk. The Billingham Hadley One will be available from 1 July 2017 at www.billingham.co.uk and authorised Billingham stockists at a suggested retail price of £265 including VAT.